Contain your dog. Train your dog. Or do both. Now pet owners can secure their dogs within set boundaries, plus train inside AND outside those boundaries. SportDOG Brand® Contain + TrainTM provides all of the containment capabilities of the SportDOG Brand® In-Ground FenceTM (SDF-100A) combined with the remote training capabilities of the SportDOG Brand® FieldTrainer® 425 (SD-425). Contain + TrainTM Collar Receiver receives a radio signal from both the Fence Transmitter and the Remote Transmitter. 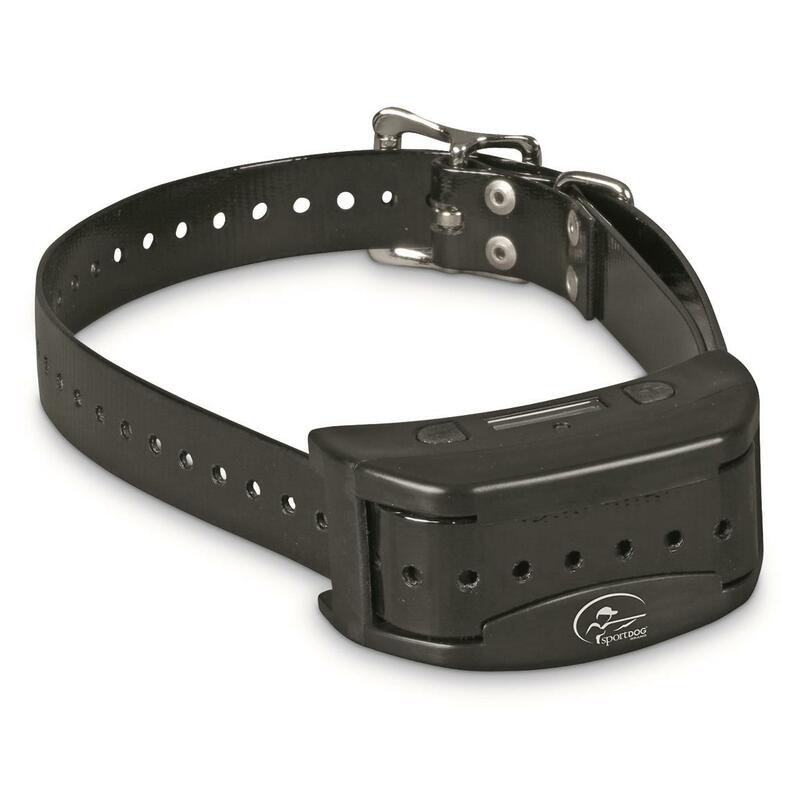 With 3 modes of operation, you decide which signals the Collar Receiver responds to. In CONTAINMENT MODE, the Collar Receiver only picks up a radio signal sent through the Boundary Wire from the Fence Transmitter. When your dog approaches the Boundary Wire and steps into the Warning Zone, he receives a warning beep. If your dog continues toward the Stimulation Zone, he'll get a safe, static stimulation that encourages him to return to the Boundary Area. TRAINING MODE lets you train your dog inside or outside of the Boundary Area. The Collar Receiver only listens to the radio signal sent from the Remote Transmitter. Use CONTAINMENT AND TRAINING MODE to simultaneously train your dog while he's being contained. Collar Receiver responds to the radio signal sent from the Fence Transmitter through the Boundary Wire, and the radio signal sent from Remote Transmitter. Waterproof/submersible Collar Receiver down to 10 ft.
DryTek® waterproof/submersible Remote Transmitter down to 25 ft. 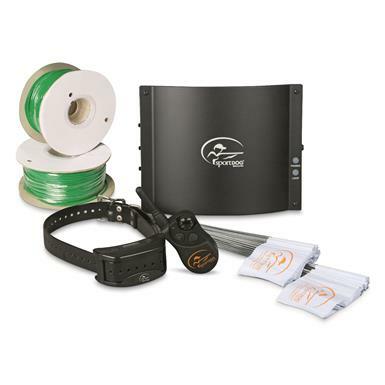 Fence Transmitter Dimensions: 7.4"l. x 2.6"w. x 9.5"h.
SportDOG Brand Contain + Train System is rated 5.0 out of 5 by 3. Rated 5 out of 5 by Mike from excellent customer service I had everything ready set up and ready to go for my new in-ground fence system except the AC power. Went to plug it in and found that the pins on the power adapter were all bent over! I called customer service and spoke to an extremely nice woman. She checked on my order status and sent the power adapter on a warranty replacement without any issues or resistance. I ordered the surge protector system at the same time and they included both parts in the same box. This was one of the most positive customer service experiences I've ever had. I'm buying SportDog brand products direct from them every time from now on. Rated 5 out of 5 by Carley from Well worth the money This thing has made life with our coonhound so much easier. The user manual for this thing is extremely helpful and well written - I recommend reading it. The ability to use this as a trainer is awesome. It seems to hold a charge really well. The whole set-up is well-built. The collar could seem a little big on small dogs but it fits our 52lb coonhound without being too bulky. We put a bandana around her neck to cover her collar and it conceals it well. I haven't submerged the remote but it has gotten rained on. The collar has been through stream crossings. After 4 months none even show a sign of wear.My wife and I both love our dog very much and were honestly concerned about using this as a training collar, but after a lot of research and experience I've learned that these things are 100% humane if used correctly. This isn't just from reading - it's from experiencing our dog while training with this also.I can only think of two things that would make this setup better. Firstly, I'd like a safety for the remote. The buttons aren't super easy to press, so I think the chances of it accidentally going off are slim, but I'd like to have this thing in my pocket or backpack without the slightest fear that it will stim or beep or vibrate the collar. Additionally, I'd really love for this to have a built-in bark limiter option.I researched hard for about a month before I bought this. Now we've had it for about 4 months and I am extremely confident the contain & train system was worth the money. Rated 5 out of 5 by Anonymous from Nice system While I have only had this system installed for a month, it seems good. I upgraded to 14 gage wire since my run is about 1100ft and some wire stays above ground because it is in a wooded area. My dog is learning his boundaries very quickly only after working with him steadily for 3 days. Very active 11 month old GSP mix. The training information that comes with the kit is very good and if you follow the steps you will have great success. I have messed around with the remote it does it’s job, however have not used it as part of the training yet, one thing at a time.